Thanks to Dr. Max Agaronov and Dr. Sui Zee, Stony Brook University Hospital, New York (USA) for contributing this case. To contribute a Case of the Week, follow the guidelines on our main Case of the Week page. (1) We recently posted information about 3 new CME courses offered by ARUP Laboratories, a Webinar sponsored by Leica Biosystems and a New Product Announcement from Kapios Health. (2) Who uses PathologyOutlines.com? We used Google Analytics to track the country of origin of user sessions from January to August 2016. The top 5 countries are US, India, UK, Canada and Australia. The complete results for all countries with 1500+ user sessions are posted here. (3) For September 2016, we set two new records: 185,398 total users and 15,988 average sessions (visits) per day. We continue to expand our Editorial Board and Authors to bring you a more informative and complete online pathology textbook. 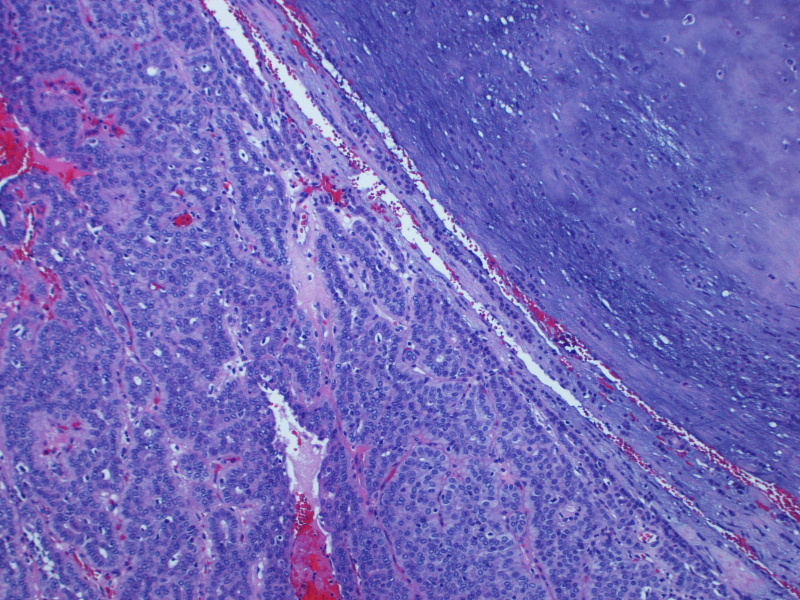 An 84 year old former male smoker presented with a progressively enlarging parotid gland lesion, now 2.6 cm. It had been present for several years. On gross examination, the lesion had an intact capsule and the cut surface was tan, lobulated and homogeneous. Microscopically, the tumor is a cellular neoplasm with solid, trabecular and focally tubular / glandular growth patterns. 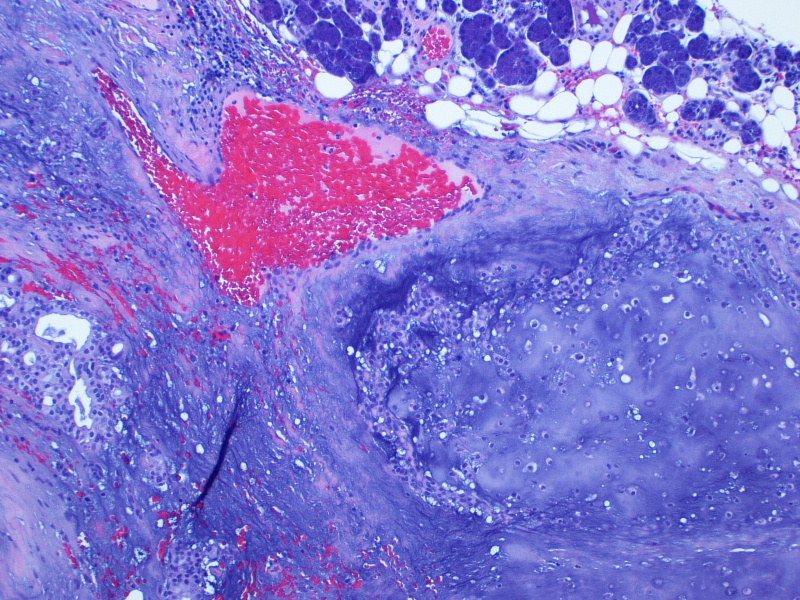 Despite the cellularity, however, there are foci of chondromyxoid stroma; this, combined with the circumscription of the tumor, leads to the diagnosis of a cellular pleomorphic adenoma (cellular PA). 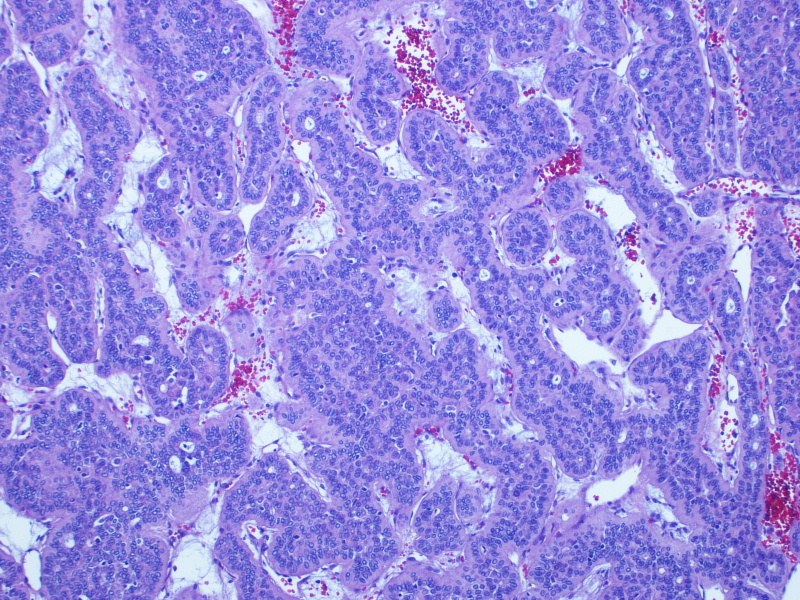 Pleomorphic adenoma (PA), or benign mixed tumor, is the most common type of salivary gland neoplasm. It represents approximately half of all parotid tumors and the majority of benign tumors in the minor salivary glands (Silverberg's Principles and Practice of Surgical Pathology and Cytopathology, 4th ed, 2005). 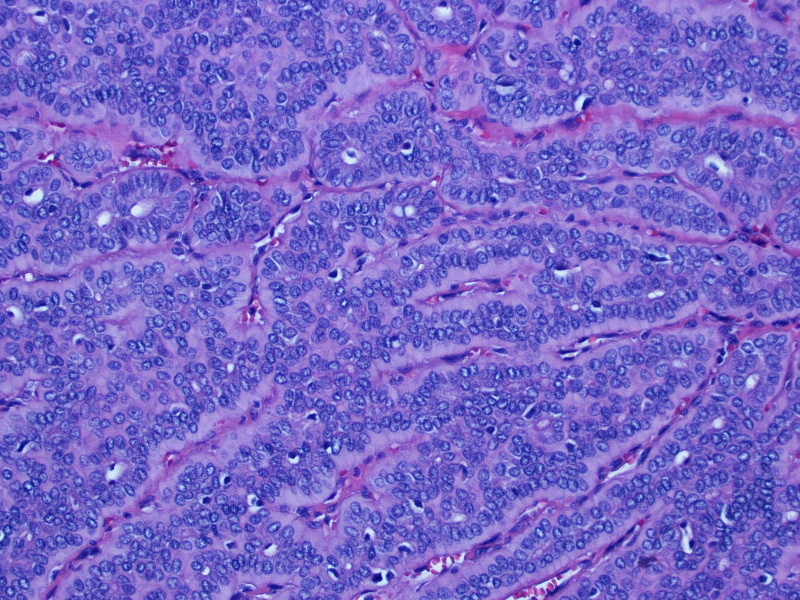 Most salivary gland pleomorphic adenomas occur in the parotid gland (~80%), 10% occur in the submandibular gland and the remainder occur in the minor salivary glands (WHO Classification of Tumours of Head and Neck Tumours, 1st ed, 2005), although it can rarely arise in lymph nodes and in the jaw bones, most likely from ectopic salivary gland tissue. These tumors grow slowly but can become very large. Patients are usually asymptomatic apart from the presence of a mass, but facial nerve paralysis can occur from compression by the tumor (Silverberg's Principles and Practice of Surgical Pathology and Cytopathology, 4th ed, 2005). PAs can have any number of microscopic appearances, but the basic requirement is that both epithelial and "mesenchymal-like areas" are present. 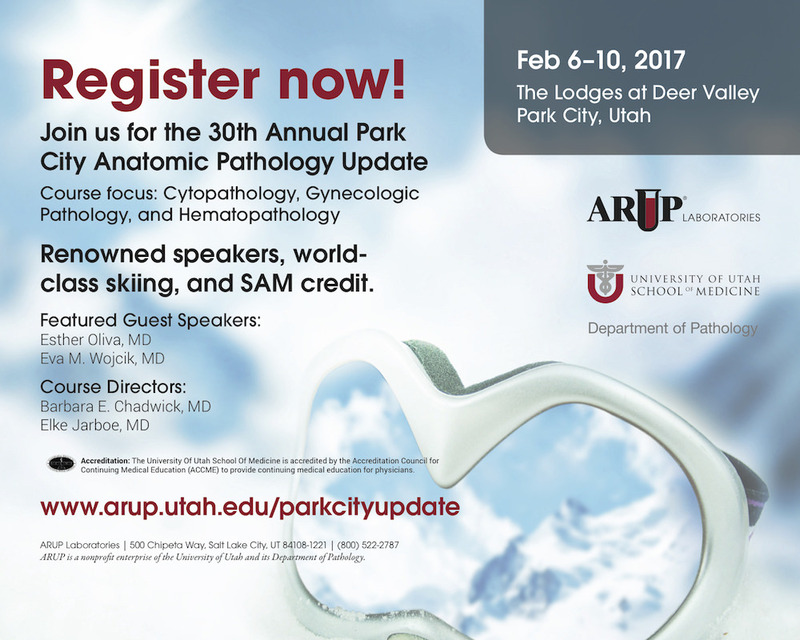 PAs are thought to be entirely of epithelial origin, with certain areas undergoing cartilaginous or osseous metaplasia. 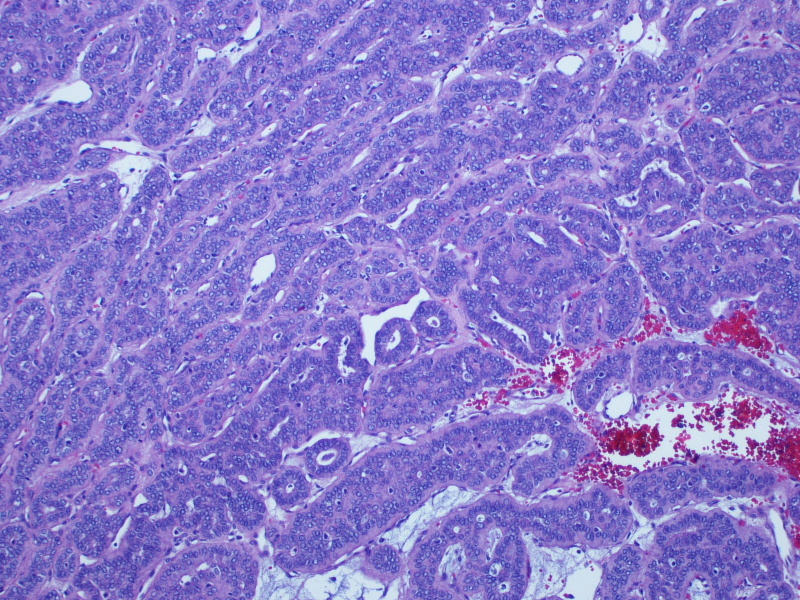 The epithelial cells have features of both ductal and myoepithelial cells, and may have many histologic appearances: spindled, clear, basaloid, cuboidal, plasmacytoid, oncocytic, mucous, sebaceous or serous acinar. 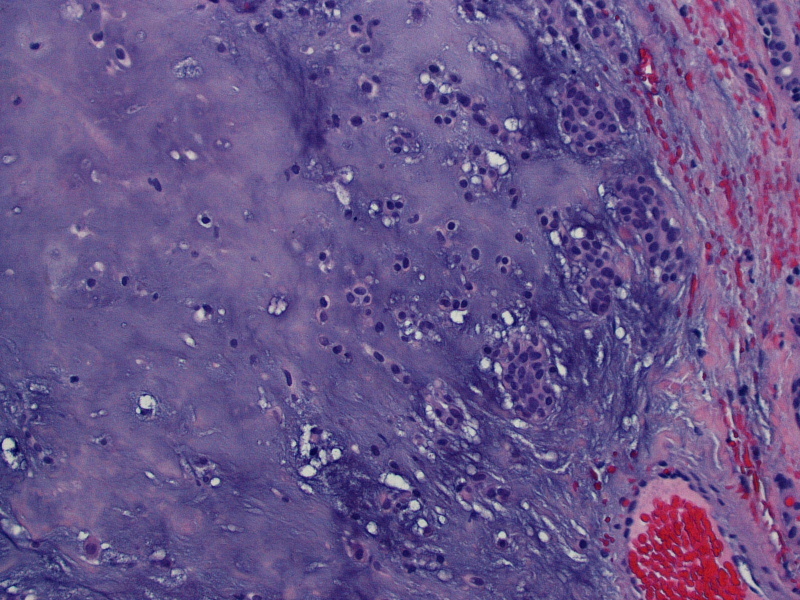 Squamous metaplasia with keratin pearls can be present (WHO Classification of Tumours of Head and Neck Tumours, 1st ed, 2005, Silverberg's Principles and Practice of Surgical Pathology and Cytopathology, 4th ed, 2005). Approximately 12-15% of PAs lack significant mesenchymal areas and are called "cellular", as in this case. Increased cellularity has no prognostic significance, however. 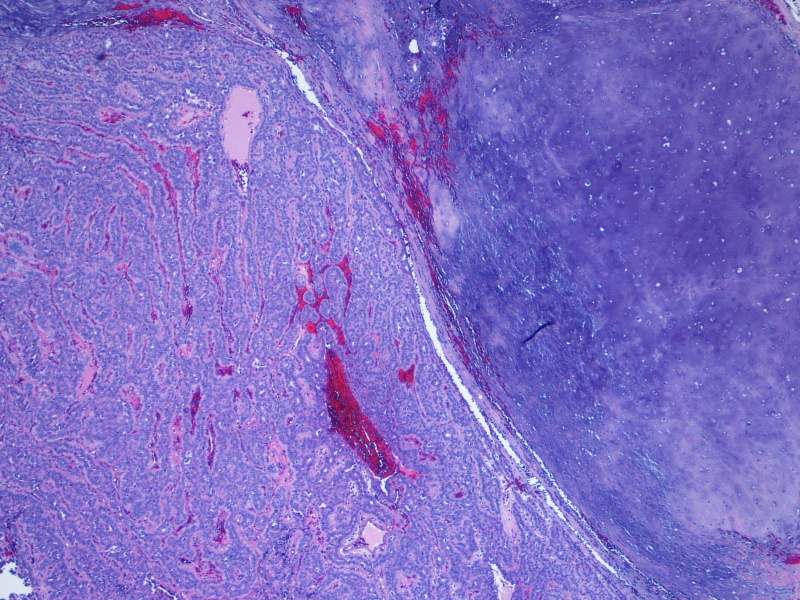 In addition, none of the following features indicates malignant potential: focal cytologic atypia, extension into the capsule, tumor "bulges" through the capsule, and the presence of benign tumor in vascular spaces. 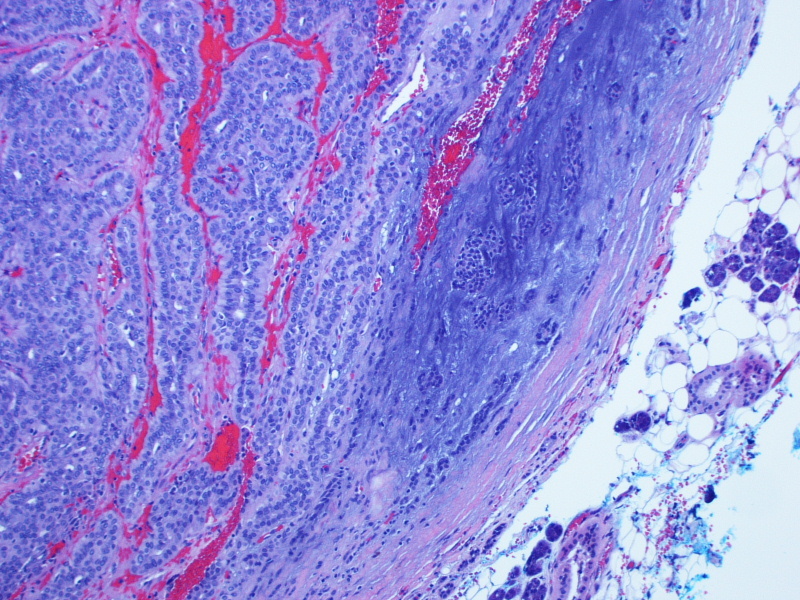 Benign tumor in vessels is thought to be an artifact of surgical manipulation (WHO Classification of Tumours of Head and Neck Tumours, 1st ed, 2005, Silverberg's Principles and Practice of Surgical Pathology and Cytopathology, 4th ed, 2005). 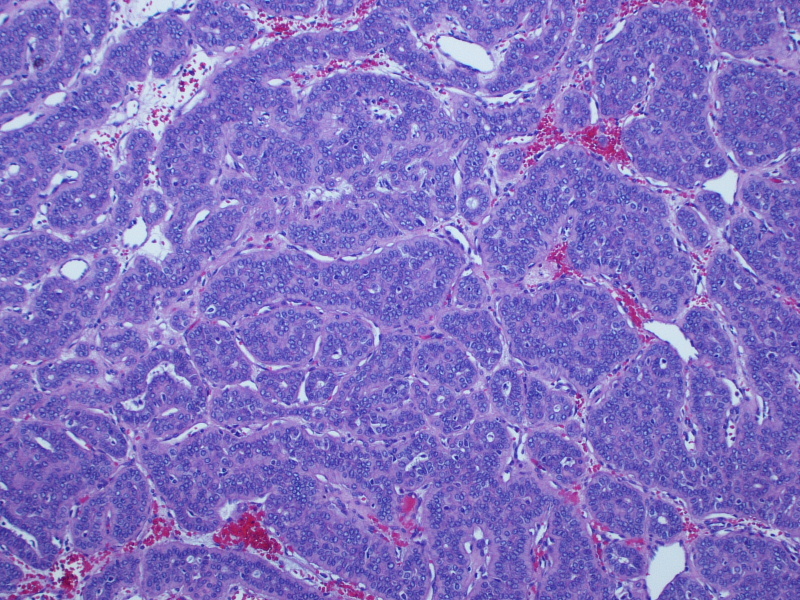 Carcinoma ex-PA generally is high grade and should be suspected when there are tumor cells with enlarged, irregular nuclei with clumped chromatin and macronucleoli, and frequent or abnormal mitoses. Frank invasion through the capsule and into surrounding normal tissue is diagnostic of malignancy (WHO Classification of Tumours of Head and Neck Tumours, 1st ed, 2005, Silverberg's Principles and Practice of Surgical Pathology and Cytopathology, 4th ed, 2005). To date, no molecular markers appear to be specific for carcinoma ex-PA. Approximately 40% of PAs have rearrangements involving 8q12, which is the site of PLAG1 (pleomorphic adenoma gene 1), and approximately 8% have rearrangements of 12q13-15, the site of HMGA2 (WHO Classification of Tumours of Head and Neck Tumours, 1st ed, 2005). 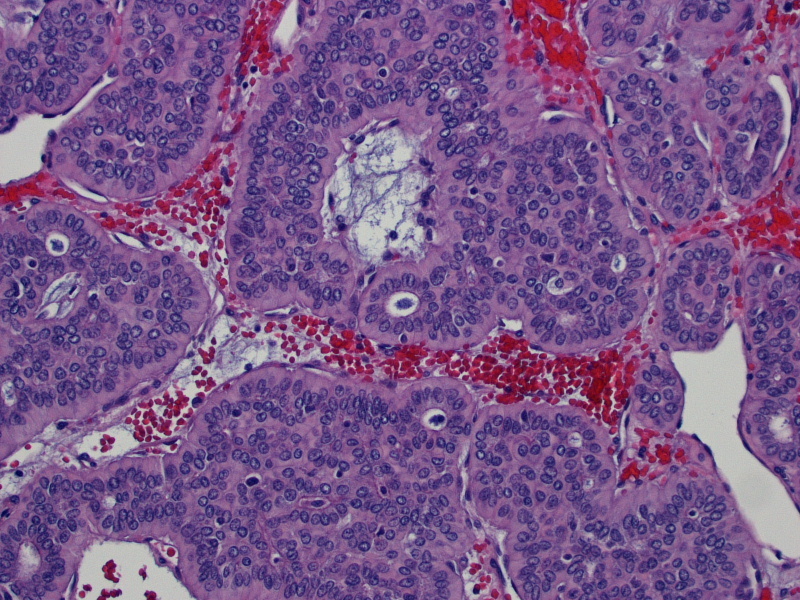 In one study, 8/16 PAs showed PLAG1 or HMGA2 rearrangements by FISH, but most of the carcinoma ex-PAs showed abnormalities in PLAG1 or HMGA2 as well (19/22; 86%). Interestingly, cellular PAs had a lower rate of PLAG1 / HMGA2 abnormalities (29%) than non-cellular PAs (78%). 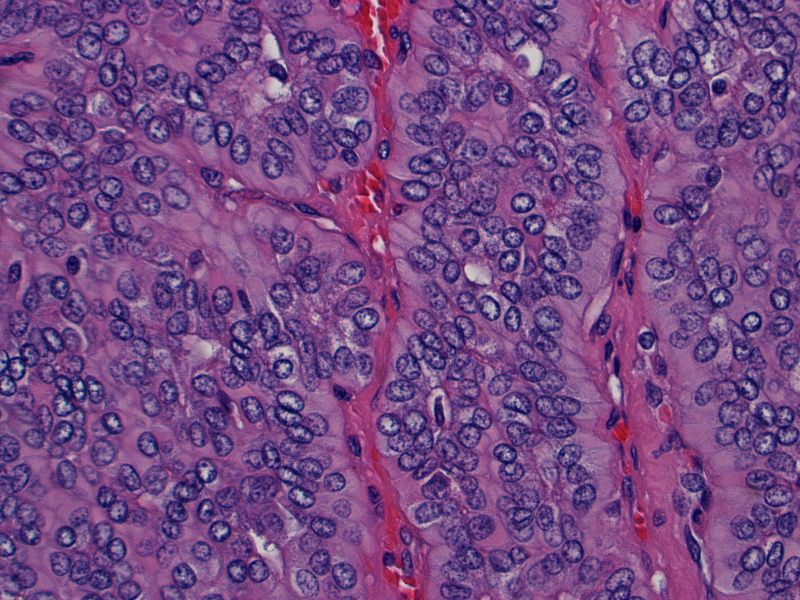 None of the de novo salivary gland carcinomas in the study showed these gene abnormalities (Hum Pathol 2015;46:26). Overexpression of p53 can be seen in both PA and carcinoma ex-PA, although much more frequently in carcinoma ex-PA (Silverberg's Principles and Practice of Surgical Pathology and Cytopathology, 4th ed, 2005); the same holds true for p21 and COX2. 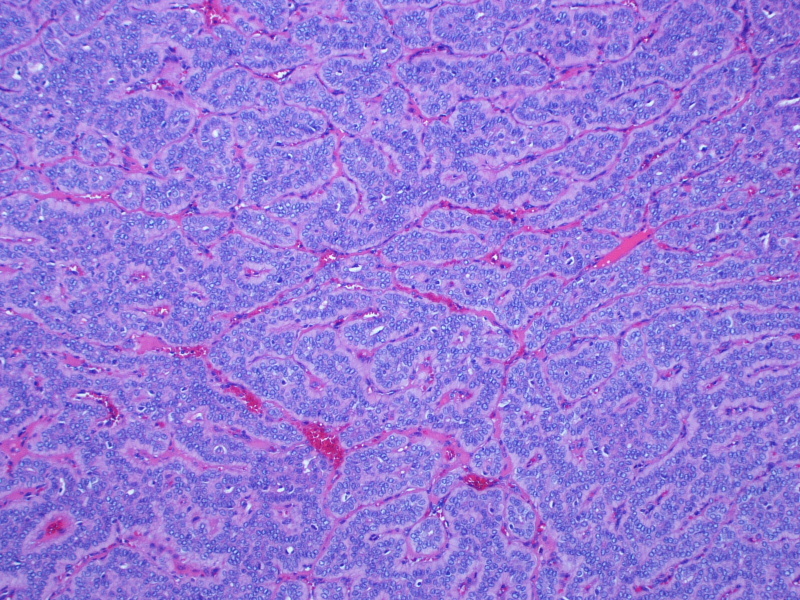 However, some studies suggest that FGFR2 and TGFβ-1 expression may be present in carcinoma ex-PA but not in PA (Head Neck Pathol 2012;6:1). PAs have a recurrence rate of approximately 8%, and the risk of facial nerve injury increases with each surgery (Silverberg's Principles and Practice of Surgical Pathology and Cytopathology, 4th ed, 2005). This patient had some facial nerve complications after the surgery, like excessive tearing, but the surgeons are expecting a complete recovery.